At first it may seem that the idea presented in the current month's article is trivial. After all, what else we don't know about the many variations of a moving average crossover? However, author Sylvain Vervoort takes the technique a step further, applying moving average crossovers on his modified Renko chart with an added twist of Heikin Ashi. The premise behind this is to reduce the noise of a typical used fixed-time-related chart and to produce less losing trades. When the 8-period “fast” average crosses above the “slower” counterpart of the same period, a long position is established. When the 8-period “fast” average crosses below the “slower” average of the same period, the long position is closed. Figure 1. 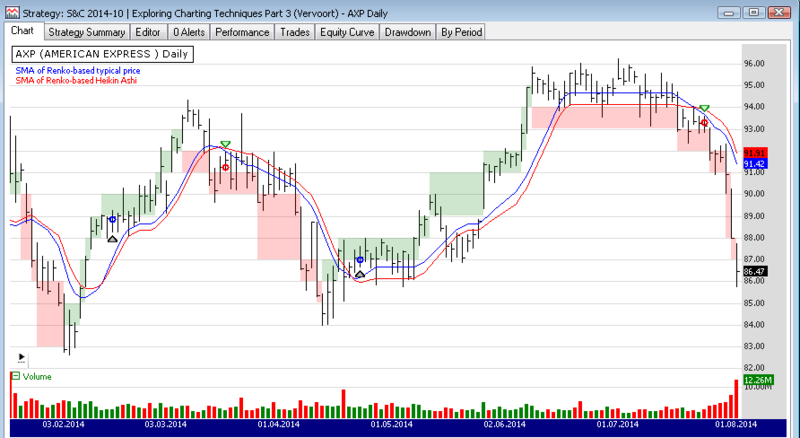 A Wealth-Lab 6 chart illustrating the application of the system's rules on a Daily chart of AXP (American Express). The green and red bricks on Figure 1 show Renko bricks supermiposed on the usual OHLC chart. To execute the enclosed trading system, Wealth-Lab users may copy/paste the enclosed strategy’s C# code or simply let Wealth-Lab do the job: in the “Open Strategy” dialog, click “Download” to get the strategy code.